Kandi Burruss is going all out to celebrate her 40th birthday– and she wasn’t alone! 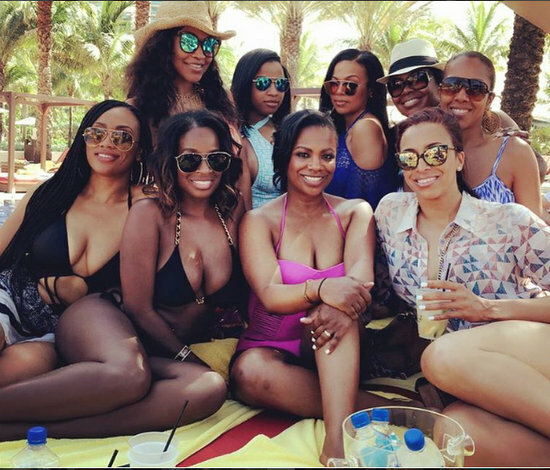 Kandi and several of her reality TV friends with May/June birthdays took a big trip to the Bahamas, bringing along spouses, kids, and personal assistants! The Real Housewives Of Atlanta star was joined by friends Rasheeda Frost, Shamea Morton, Monyetta Shaw, Toya Wright and many more! Photos of the Taurus/Gemini Bahamas Birthday Turn-up are below! Torrei Hart Gets An Awesome Birthday Gift From Ex-Husband Kevin Hart! Take note, ex-wives of famous men! It pays to get along with your ex! Torrei Hart, star of Atlanta Exes, was a lucky lady this birthday when her ex-husband, Kevin Hart, gifted her with a brand new Cadillac Escalade! Torrei shared a photo of her new wheels on Instagram, gushing about her generous ex. Kevin has been enjoying huge success in the movies recently and he clearly likes to share the wealth with those he’s close to! Last week it was confirmed that Hollywood Exes will not be returning for another season on VH1, which had many fans asking if Atlanta Exes would suffer the same fate. Cast member Tameka Raymond shared her thoughts on the subject and it sounds a little like fans shouldn’t hold their breath! Tameka dished about her experience with the reality show and whether or not it’s returning for a second season. Hot Photos: Reality Stars At New York Fashion Week and More! The reality stars are out in force this week – mostly congregating in NYC for Fashion Week. Hopefully some of them picked up a few pointers along the way! Not only do we have some fashion week pics, but also some celebs getting their fitness on (Lisa Rinna) and catching flights (NeNe). Among the stars hitting up various NYFW events: Porsha Williams, Kristen Taekman, Claudia Jordan, Mimi Faust and more. A few reality stars walked runways for shows – NeNe Leakes, Kendall Jenner, and Demetria McKinney to name a few. Below you’ll also find hot pics from Tameka Raymond, Rachel Zoe, Stassi Schroeder, Cynthia Bailey, and more! Take a peek below! Hold the phone! Did y’all know there are people out there who think the blossoming new love between pimp momager Kris Jenner and her younger beau Corey Gamble is anything less than true and pure? In fact, some naysayers think that this relationship only seeks notoriety and media attention. Seriously people, are we really that jaded? I, for one, think there is nothing more beautiful than seeing a krazy kougar with a man who clearly wants women in the spotlight. It’s a match made in heaven…or at least Ryan Seacrest’s version of heaven. Of course, in the wise words of T-Swizzle (love her, don’t judge), the haters gonna hate, hate, hate, hate, hate. Corey’s ex Sheree Buchanan, ironically (or not so much?) of Atlanta Exes, is speaking out about the pair’s tumultuous relationship. Monyetta Shaw is on a show called Atlanta Exes but reveals: never say never, where her ex Ne-Yo is concerned! How would that work for her reality career? Can we say: Spinoff! And Kris Jenner may have found a new man, but is he with her for the right reasons?